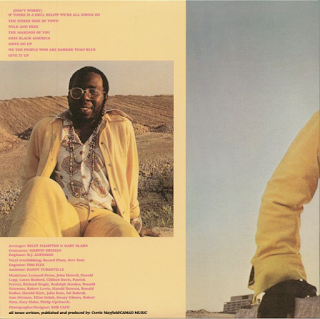 Along with Sly & The Family Stone and the "psychedelic" era Temptations, up there at the very forefront of black social consciousness artists was Curtis Mayfield. Before Marvin Gaye's "What's Goin' On", this album really shouted it out - loud and proud. Curtis knew somethin' bad was goin' down, brothers and sisters, and he used his exhilarating falsetto and supa-funky backing to let us know. The opener "(Don't Worry) If There's A Hell Below, We're All Gonna Go" is an eight minute remarkable piece of melodious, funky protest music. It cooks, big time. "We're gonna go..Lord what we gonna do..."
"The Other Side Of Town" may have a nice string-dominated backing, but it is a dark song about depression and living on the wrong side of the tracks. The future is bleak. Against the backdrop of such a beautiful, soulful backing, Curtis gets his bitter message across. 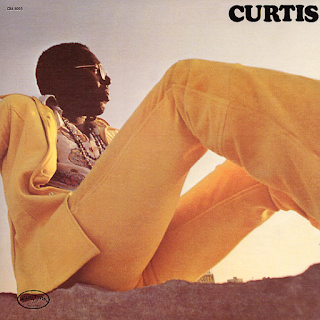 "The Makings Of You" sees Curtis in a more relaxed frame of mind, a romantic, beautifully orchestrated ballad. "We The People Who Are Darker Than Blue" is another in the dark vein, but the spirits are also lifted by the well-known and much-covered strains of "Move On Up". "Miss Black America" is a touching song about the aspirations of his young daughter to be seen as black and beautiful. Sounds awful that she would even have to think that today, but it represented real progress in the early 1970s to have such a competition. "Wild And Free" is not the best track on here, over-orchestrated, to be honest. It does, however contain the memorable line "respect for the steeple, power to the people". "Give It Up" is a horn-driven soul number to finish and raises the mood a bit. Nice bass underpinning it. One can't help but think that the cornerstones of "Hell", "The Other Side Of Town" and "Darker Than Blue" are the ones upon which this album and its message rests. A seminal album in the history of black music, but not one that always gets mentioned. This remastered release has the best sound I have heard so far for this album. It has always been a bit tinny, what with all the orchestration. This redresses the balance and brings a subtle bass into the sound, thankfully.